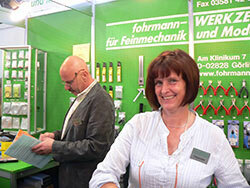 For over 40 years the name stands fohrmann for a comprehensive tool for pattern Bahner and modellers. The result is the fohrmann-WERKZEUGE - programm in year 1974 from the creation of a model train expert business by Norbert Fohrmann. Five years later, the first tool catalog appears. During this period the interest in two smaller tool factories, resulting in an own tool manufacturing takes place. In 1983 the model train shop and fohrmann-WERKZEUGE moves into the new premises on the site of a disused colliery in Waltrop. The program will be further extended and special tools that you can hardly find in the usual tool trade, be developed. Customer requests play a major role. In 1992, the company is converted into a GmbH. The catalog is published in three languages ​​since 1993 and since 1998, the website is being prepared. In September 1999 the first customer ordered www.fohrmann.com. In summer 2000 a successor is sought and "Der Modelleisenbahner" found through an advertisement in the magazine for the company. 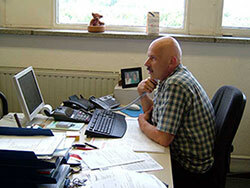 There is the move to Görlitz on the Neisse and from 01.01.2001 accepts Roland Kühn, as the new CEO, the company. Norbert Fohrmann supported the launch and the delivery will continue uninterrupted. In the first year, customers met both the old and new managing directors together at model railway exhibitions - only sometimes surprised about the new address. The fohrmann-WERKZEUGE - program will be continued in the old tradition as a family, good quality and satisfied customers are important to us. Through the Internet, many new customers have become aware of us. Our range of consumables and tools is constantly expanding, new ideas are implemented within the framework of possibilities. Many of our tools are manufactured according to our specifications by selected partners, in small series, assembled with us and finished. Our customers include thousands of hobbyists and modelers, architectural, engineering, craft businesses, schools and universities in over 30 countries. A thank you to our customers, where our commitment will continue in the future and to all those who support us with advice and support in implementing our ideas.